Mesothelioma is a rare form of cancer that is known to be caused by exposure to asbestos fibers. Mesothelioma forms in the mesothelium, which is a thin membrane that lines the chest, heart, abdomen and surrounding organs. Most often, mesothelioma is on the outer lining of the lungs (the pleura) but it can also arise in the lining of the abdominal cavity (the peritoneum), the sac that surrounds the heart (the pericardium) or the lining of the testis (tunica vaginalis). Generally a diagnosis of malignant mesothelioma needs to be confirmed through a biopsy. Often a person with mesothelioma last worked with asbestos containing products or was exposed to asbestos in another manner more than 20 years before diagnosis. It can take between 15 to 50 years for mesothelioma to develop after exposure to asbestos (this is called the latency period). Fortunately, not everyone who is exposed to asbestos develops mesothelioma. However, even small amounts of exposure can cause mesothelioma. There is no known safe level of asbestos exposure. If you have just learned that you or a loved one have a cancer diagnosis, you may be feeling too numb to think about what you need to manage the stress and anxiety that naturally comes with diagnosis and treatment. For additional information on mesothelioma cancer pain, treatment and emotional support for you and your family, please see the following cancer support resources. 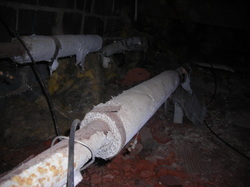 Asbestos insulation on water pipes. Asbestos has been used in a wide variety of industrial and construction products and its use greatly increased during World War II. This is true, despite the fact that exposure to asbestos fibers has been recognized as an occupational health hazard since the early 1900's. Asbestos has been widely used in many products, including drywall joint compound and patching products, stucco, brake linings, clutches, boilers, gaskets, packing, roofing felt, fertilizer, furnaces, flooring products, textiles, electrical products, asbestos cement pipe and insulation - just to name a few. What is Involved in an Asbestos Lawsuit ? In some States, special laws enable mesothelioma patients to receive a trial date soon after filing a lawsuit. For this reason, it is extremely important to move forward as quickly as possible. Potential asbestos exposures must be investigated and companies that may be liable must be identified. After investigation, a single Complaint against all companies is filed, which starts the case. After a Complaint is filed and all defendants have Answered, the parties proceed to conduct discovery, which is the process whereby facts relevant to the lawsuit are identified. Each side can send the other written questions (called interrogatories), requests for documents and requests for admission of certain facts. This type of discovery is usually done early in the case and then the parties hold depositions to clarify and expand on the information exchanged. Full and fair value for our clients is the primary goal. This is normally done through settlement, which is how the vast majority of cases resolve. Although only about 5% of cases go to verdict, we often start trial before the remaining defendants agree to settle. We will keep you informed every step of the way and will allow you to set the course of your case within the legal parameters set by the court. Many asbestos product manufacturers have filed for bankruptcy and therefore, cannot be sued in court. When a company files for bankruptcy reorganization, it is protected from lawsuits. However, the U.S. Bankruptcy Code allows for the creation of asbestos bankruptcy trusts. Asbestos defendants who have been approved for bankruptcy reorganization under code section 524(g) are required to fund these trusts with money to pay current and future asbestos claims. While it is significant that a company seeking bankruptcy reorganization is still required to compensate a person it harmed, the amount paid by each bankruptcy trust generally is much lower than what could have potentially been gained in a lawsuit. Since most trusts do not have enough money to fully pay all present and future claims, they offer asbestos victims a percentage of their claims. The amount of money paid by a trust depends on the type of injury and amount of exposure and varies widely between each trust. Each trust assigns different values to different types of asbestos injuries. Bankruptcy trusts require certain proof when filing a claim. 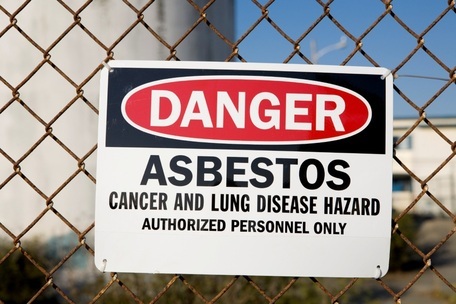 Claimants must show evidence of an asbestos-related disease, and may have to satisfy certain medical criteria and prove exposure to asbestos for which the company is liable. It is best to consult a mesothelioma attorney about whether you can file an asbestos trust claim, an asbestos lawsuit or both. Contact the Law Office of Anna Costa at (510) 410-5050 or Acosta@costalawyer.com. We are knowledgeable about the litigation and trust claim processes. We can also let you know how filing one type of claim may affect the amount of compensation you may be eligible to receive through the other type of claim. How Much Does it Cost to Investigate an Asbestos Claim? At the Law Office of Anna Costa there is never an out-of-pocket cost to you for any our services, including the preliminary investigation of your potential claim. if you later decide to retain Ms. Costa as your attorney, we will work for you on a contingency fee basis. This means we are paid only if we win a judgment or negotiate a settlement on your behalf. If we receive a monetary award or settlement, our fees and expenses will then be subtracted from the settlement amount. If you or someone you know has been diagnosed with mesothelioma, asbestosis or lung cancer, there is a set period of time within which an asbestos-related lawsuit may be filed. This is called a Statute of Limitations and it is very important to file a case within the appropriate deadline (Most Asbestos Bankruptcy Trusts also have deadlines for filing claims). If the Statute of Limitations has expired relative to your situation, your asbestos lawsuit may be barred. All States have their own Statute of Limitations deadlines. Please consult an attorney to determine the applicable Statute of Limitations for your case. * Located in San Leandro California the Law Office of Anna M. Costa serves mesothelioma, asbestosis and asbestos lung cancer clients throughout the United States, as well as in California. **The information contained in this site is general in nature, and is not intended to constitute legal advice. Communications between the law firm and prospective clients are confidential, but no attorney-client relationship is created unless a contract for legal services is signed.